The dab might be dead and buried, but its legacy lives on in an unexpected fashion. A math teacher in France has taken the Manchester United midfielder's signature celebration and turned into a math problem. Is Paul Pogba's dab a perfect dab? That's what the problem intends to determine. Cristiano Ronaldo (who else?) 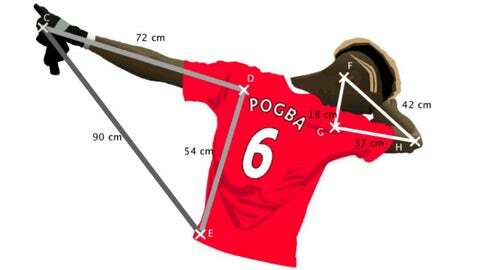 is jealous of Pogba's dabbing ability, the word problem reads. Per the “Universal Laws of the Dab,” a dab is perfect if and only if the triangles with the dab form right angles. Given the measurements of the sides of the triangles formed, we have a trigonometry problem on our hands. Do the triangles Pogba form with his dab constitute a perfect dab? In case you're a sadist and want to figure it out on your own, the answer can be found below. I gave it a whirl and realized just how hard trigonometry is, and then remembered why I ended up doing what I do now as opposed to working with numbers all the time. I busted out the notepad and looked up the formulas, but alas, got frustrated and decided to cheat. I'll blame it on not having a graphing calculator handy. The answer, based on the measurements given, is no. Sorry, Pogba, but your dab is not quite perfect. His trailing arm forms a perfect 90 degree angle to his shoulder, but the smaller triangle is just a hair off. The angle there is just a bit obtuse at 93.056 degrees. Either way, I would have flunked this quiz because I couldn't show my work. Looks like it's back to Dab Academy for both Pogba and me.